Last week I wrote about my dilemma over an expiring Korean Air award. I’ve now found a solution and thankfully salvaged the ticket. 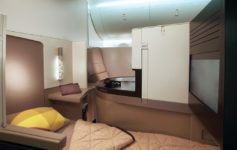 Since Korean Air SkyTeam partner award tickets must end in the same country as they begin, I was stuck flying to either Dubai or Abu Dhabi, both part of the United Arab Emirates. It’s too bad, because I would preferred to fly into Tel Aviv, also part of the Middle East region, and then returned to the USA on the EL-AL 787, a product I have been wanting to review for quite some time. Oh well. The original plan was to fly on Aeroflot via Moscow, but since that space is apparently blocked, I was forced to look elsewhere. From Los Angeles, the only space that appeared available was on Saudia. Now I would have taken Saudia if I had to…it was a very pleasant journey last year…but I used Expert Flyer instead to piece together a slightly more complex routing. I found award space on Aeromexico from Los Angeles to Paris via Mexico City. Aeromexico has two flights per day from MEX to CDG and I made sure to book the 787-9 flight, which features reverse herringbone seating and direct aisle access from every seat. The other flight is operated by a 787-8 which has 2-2-2 business class seating and no direct aisle access if seated at the window. From Paris, I’ll connect to an Air France 777-300ER to Dubai. That flight also features reverse herringbone seating and will give me a chance to at least peak at first class. Air France First Class remains at the top of my travel bucket list. It’s icing on the cake, but I also received a refund of $242 because Aeromexico has no fuel surcharges while Aeroflot does. The change fee was $30 so I came out way ahead! It’s been a long time since I’ve been able to do a real “review” trip. I am happy to try to new airlines for the first time and review two new business class products. As much as love first class, these business class reviews are more helpful for more people. Stay tuned for the trip next month. Previous Article What Is The Appropriate Age For Ditching Kids On Airplanes? Prepare for disappointment on AeroMexico. Their photos make it look 100% better than it really is. Probably the worst business class meals I have ever had and lackluster service. Seconding this. Literally every flight I’ve had on AeroMexico has been a disappointment. The seats on the 787-9 are great, but they’re not anything you’ve not experienced on literally every other carrier with the reverse herringbone seats. What really sets them apart, though, is apathetic-to-just-plain-rude service and the inedible food, especially catered dishes out of MEX where it should be the best – at least for dishes with Mexican flare. They just…so, so terrible. Not to piss on your parade, but just please temper your expectations. I hope there’s plenty of extra bathrooms on the AeroMexico flight(s) to deal with the horrible food. @Matthew if you were up for it just order a special meal. Otherwise it’ll likely be a carb-overload with whatever options they present to you. I’m not one to be dramatic, but I was deathly ill for five days after an AeroMexico business class meal on a MEX-JFK business class flight. I would never eat their catering out of MEX again after that experience. And I am not trying to be appreciable but I have flown over 200 longhual trans-atlantic and deep south america flights on AM and have never once been sick. Your illness was likely borne of something other than the flights meal, otherwise the entire plane would have fallen ill as well. I think MEX is a fun airport. Sure it’s kind of run down, and way more spread out than it should be (T1), but I always seem to enjoy myself when I’m there. This sounds like a fun itinerary. You used to be able to find a “reasonable” La Premiere fare here or there, but I haven’t seen one or heard about one recently. I’m glad you’re trying AF. I have maybe 16-20 long haul segments and 10 short ones with them and I find them to be well above average. Please let me know if you ever see any reasonable La Premier fares. The fares ex-Algeria to Beijing seem to have been pulled.